Moscow State Academy of Communal Services and Construction is the biggest institute of higher education, providing training and retraining of specialists without dropping work for communal sector and construction sector. About 15 000 students acquire professions on a full-time tutition, evening classes, by correspondence and accelarated training. 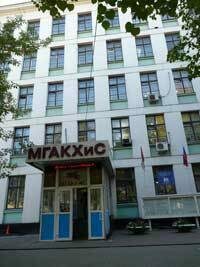 For the first time in Russia the institute prepared and realized the form of training of engineers for the housing and utilities complex combining a full-time tutition and with a work on a factory.